Integrating the Mediterranean Diet into your lifestyle is not difficult. All you have to do is to change what is in your cupboards and alter your shopping habits somewhat. You'll find yourself enjoying the simple light fare, and there will be no more work in the kitchen than usual, in fact, probably you will find that you save time. The first thing you should do is take a good look at what is in your refrigerator and pantry. Get rid of any oils that are not monounsaturated. Especially do away with solid cooking oils, such as Crisco. Throw out the margarine. If you have some butter on hand, that is fine, but remember that you will use it in moderation. Doing away with artery-clogging fats should be your very first step. Now take a look at the processed foods that you have sitting around. Take a paper bag or two and fill them up with the boxes of macaroni and cheese with their day-glo powder. Ditch the Jello packets, instant biscuit mix, and cans of spaghettios. Put all unopened items into one bag and donate it to your local food bank. They'll appreciate it. Toss out the rest. Don't worry about being wasteful, the real waste is feeding your body unhealthy food. Take a look at the grains that you have sitting around. Consider replacing them with whole grain versions. Definitely throw away any sugary cereals. Is that your children I hear protesting in the background? That's okay. They can become accustomed to a healthy diet, and the sooner the better. The Mediterranean Diet is more than a way to lose weight; it is a lifestyle. Children can obtain plenty of nutrition from it, and better to hear whining now than to have to deal with your kids being overweight or unhealthy later. By now, you should have a refrigerator filled with only the basics-eggs, milk, yogurt, fruit and vegetables. The pantry should have whole foods, or simple foods, such as cans of beans and tomatoes. You will want to replace some of the foods that you have eliminated from your kitchen. Start with the cooking oil. Buy some quality extra virgin olive oil. This will serve as a flavorful oil that you can use as a replacement for butter. Also buy some 'light' olive oil, keeping in mind that the lightness is not referring to calories, but rather the flavor. You can use this oil in any dish without worrying about the recipe taking on an Italian flavor. I have even used it when preparing baked goods. Buy some plain yogurt to replace any of the sweet yogurt that you may have had. You can sweeten it with Splenda or a bit of honey. You can also add real fruit to it, which will be much more nutritious than the fruity syrup that is added to most commercial yogurts. Take a look at some of the more exotic cheeses in your supermarket. A goats' milk cheese, such as Chevre, is lower in fat and calories than are most cow's milk cheeses. You may also want to get some low-fat mozzarella and a strong parmesan. A little parmesan can go a long way when it comes to flavor, if you buy a well-aged piece, as opposed to the powdery stuff in the green can. Don't worry about the expense, as you will find that cooking with whole foods will counterbalance the extra money you are spending on quality ingredients. After all, how much do rice and beans cost? They will become a staple of your diet. Buy some fresh fish, enough for one evening. Also buy fruits and vegetables to last for a couple of days. For the Mediterranean Diet to work, you will have to make a quick trip to the store every couple of days. You really can't beat fresh ingredients, and unless you have a garden in your backyard, it will be difficult to get the amount of fresh vegetables which are an essential part of the Mediterranean guidelines. Of course, if shopping this often proves difficult, you can cheat a bit and buy frozen vegetables. However, the flavor will suffer, and this will make it harder to stick to your new way of eating. A good way to integrate grocery shopping into your life is to do it the Mediterranean way. Take a walk every evening to your local market, if one is available. You may want to do your shopping directly after work if stores are more convenient in the area in which your work. It can be very satisfying to walk into a store and see what produce looks good that day, and plan a meal around it on the spot. For example, if you see that the squash and green beans look particularly good, grab a tomato and a chicken breast or two and do a quick sauté of them. 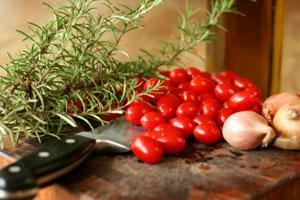 Have fresh herbs on hand if you have a green thumb, because they will also greatly enhance the flavor of your food. When you sit down to eat, make the vegetables the focus of the meal, rather than the meat. The meat should be an accompaniment. Have a bit of bread with a drizzle of flavorful olive oil, but not too much. Have a glass of wine. If you crave something sweet, have a piece of fruit. In fact, a lunch can be based around a couple of pieces of fruit, a few bites of cheese and a bit of bread. By watching your portion sizes, and eating in this healthful way, you can drop pounds with a glass of wine in one hand and a golden pear in the other. Now that's the way to lose weight and get healthy!